The Way of the Horse, an interview with Kathleen Barry Ingram. Radio Interviews: Listen to Kathleen’s recent interviews regarding her work with equine facilitated learning. Relationship in Motion: Click here to listen. The IFEAL “Dare to Live” Programme, a Program for Returning Veterans. Kathleen is Co-Creator and the Mental Health and PTSD consultant for this program. 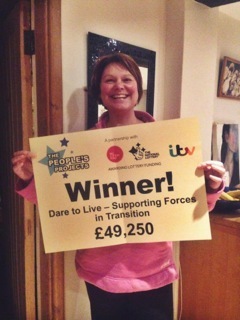 The Dare to Live Trust secured enough votes for the People’s Projects and was awarded £50,000 from The Big Lottery Fund! The Dare to Live Trust is a cutting edge education and life skills program that aims to improve the well-being and ease the challenges that servicemen and women experience as they transition into civilian life and young people experience as they transition into adult life. For many servicemen and women, their greatest fight for survival occurs not in combat but when transitioning back into civilian life. Dare to Live provide Equine Assisted Human Development program to serving and ex-servicemen and women suffering from depression, anxiety or PTSD as a consequence of combat-related trauma. The funding means that Dare to Live can offer 40 places on their Equine Facilitated Human Development program to serving or ex-military men and women, who are struggling to make the transition to civilian life. My student’s personal journey after completing my mentorship program and IFEAL facilitator training.